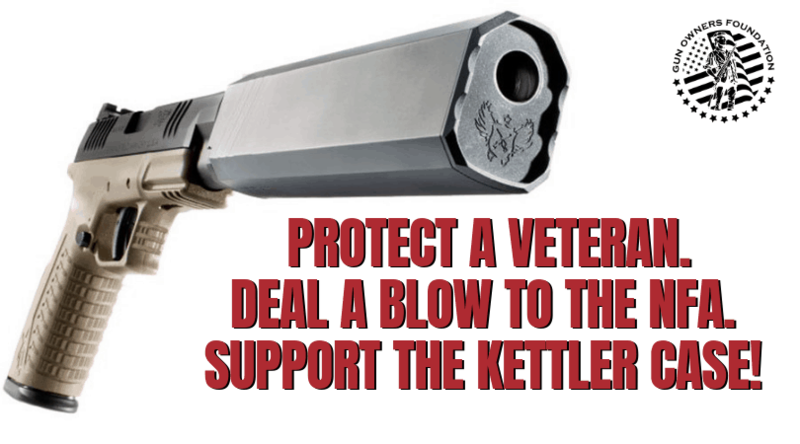 (January 14, 2019) — Gun Owners of America (GOA) and its litigating arm, Gun Owners Foundation (GOF), today continued their defense of Jeremy Kettler, a disabled combat veteran, against a conviction for violating the National Firearms Act. Read GOA’s petition for certiorari before the U.S. Supreme Court. Click here to contribute to this case. The Kansas statute declares that any suppressor manufactured, possessed, and used within the borders of Kansas is exempt from federal law. Relying on that Kansas law, in 2014 Jeremy purchased a suppressor from a local military surplus store, but did not register it with ATF pursuant to the National Firearms Act (NFA). Believing he was following the law, Jeremy posted a video about his new suppressor on Facebook, and ATF swooped in. Rather than simply requiring Jeremy to register his suppressor, the feds instead chose felony prosecution — to make an example of Jeremy, and to intimidate all who resist federal power over guns. Jeremy was indicted, and convicted of possessing an unregistered silencer, and now this veteran is a federal felon. GOA and GOF have stood with Jeremy, both in his appeal to the U.S. Court of Appeals for the Tenth Circuit, and now in the U.S. Supreme Court. Today GOA and GOF lawyers, representing Jeremy, filed a petition for a writ of certiorari in the U.S. Supreme Court, asking the Court to hear Jeremy’s case. The petition challenges the decision of the United States Court of Appeals for the Tenth Circuit, which rejected Jeremy’s appeal from the district court. In fact, each of the reasons the Supreme Court gave in 1937, finding it to be a tax, no longer apply today, 82 years later. 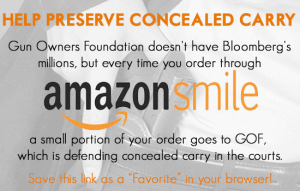 Rather, the NFA has become what Justice Frankfurter once described as regulation “wrapped … in the verbal cellophane of a revenue measure” — an unabashed gun control regulatory scheme, designed not to raise revenue for the federal government, but instead to keep NFA items out of the hands of Americans. Next, Jeremy’s petition challenges the Tenth Circuit’s absurd holding that the Second Amendment applies only to “bearable arms” — but not firearm accessories, such as suppressors. The petition points out that the Second, Third, Seventh, and Ninth Circuits all have concluded that the Second Amendment extends beyond actual firearms to ammunition, magazines, the ability to purchase firearms in gun stores, and the right to practice at shooting ranges. Finally, Jeremy’s petition argues that, if the Supreme Court continues to uphold the NFA as a “tax,” then it is allowing Congress to impose a tax on a constitutionally-protected right — something which the Supreme Court has long said to be unconstitutional. While some do not seem to mind ATF’s regulation of weapons covered by the National Firearms Act, GOA and GOF have stood for the right to own “bearable arms” of all types, and firearms accessories as well — including suppressors and machineguns. This Court has allowed many Second Amendment challenges to go by the boards, although not without some if its members drawing attention to what was called this “distressing trend: the treatment of the Second Amendment as a disfavored right.” Peruta v. California, 137 S.Ct. 1995, 1999 (2017) (Thomas, J., dissenting from denial of certiorari). This case provides an appropriate vehicle to address the question of whether a tax on the exercise of Second Amendment rights is permissible. Jeremy Kettler’s petition presents solid, well-argued questions important to all gun owners, and we hope the Court will grant certiorari to decide them. Read GOA’s petition for certiorari here — and the Appendices here. And click here to contribute to this case.